From children participating in youth sports to college athletes competing at the highest level, Taylor Physical Therapy can develop a program that can not only improve athletic performance, but help athletes recover from injury so they can return to competition. Whether you need to recover from an injury or you’re looking to take your game to the next level, Taylor Physical Therapy can help. Fill out the form below to contact our team and get started. Injuries are part of sports, but with our dedicated team of physical therapists, athletes can return to competition in a safe and efficient manner. We work with local athletes to not only help them recover from injuries by developing a custom rehabilitation program, but to help prevent future injuries. These programs will help you recover, but will also allow you to progress so you can to return to competition when you’re ready, not before. We also provide progress reports for coaches and parents, as well as education for athletes so they understand their injuries. Stop in at our Saturday morning sports clinic in Waverly from 7:30 am to 10 am August 25th through October 20th . Taylor Physical Therapy can also help athletes reach their peak performance level with our sports performance training program. This program develops sports-specific, position-specific and age-specific skills over the course of six weeks with two to three sessions per week. This program is designed to emphasize sport specific training to maximize performance, identify potential weaknesses in individual athletes, and corrects them with specialized exercises designed to improve strength, balance and flexibility to maximize performance while reducing the risk of injury. Our program is led by our director of sports performance, who is both a certified athletic trainer and certified strength and conditioning specialist. This unique combination of knowledge allows him bridge the gap between rehabilitation and performance with our athletes as they either work to return to play following injury or strive to improve athletic performance and prevent injury. 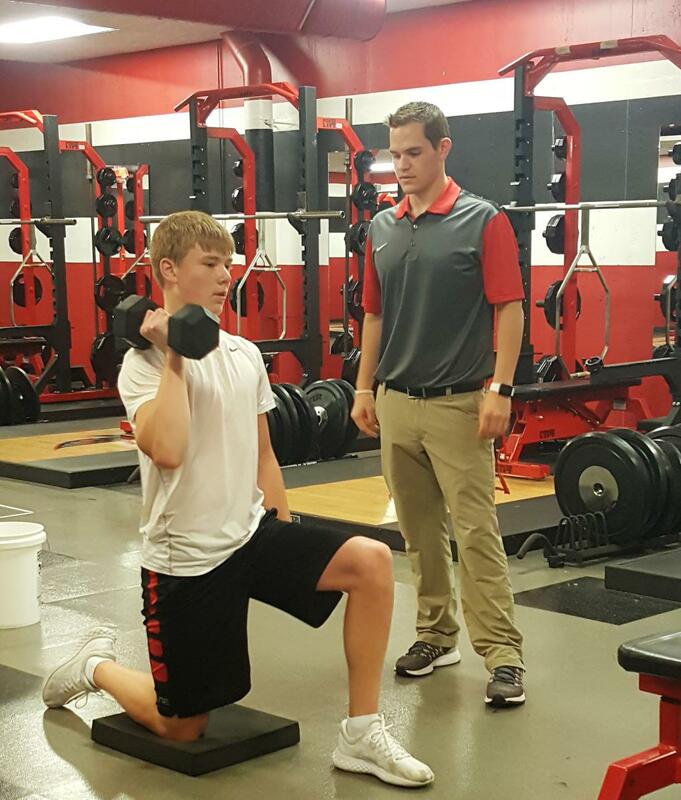 Aplington-Parkersburg High School: Fulltime Athletic Training Certification (ATC) covering lifting, practice and athletic events, and daily on site assessments. Janesville High School: Weekly evaluation and assessment of athletic injuries. Nashua-Plainfield Schools: Fulltime Athletic Training Certification (ATC) covering practice one day per week, event coverage for football games. North Butler Community Schools: Event coverage for football games. Sumner-Fredericksburg High School: Fulltime Athletic Training Certification (ATC) weekly coverage for Volleyball and Track and Field. Tripoli Schools: Fulltime Athletic Training Certification (ATC) covering practice one day per week, event coverage for football and home wrestling tournaments. Waverly-Shell Rock High School: Fulltime Athletic Training Certification (ATC) covering lifting, practice and athletic events. Weekly onsite assessments and Saturday Sports Clinic in the fall. Waverly-Shell Rock Middle School: Special summer time sports conditioning programs. We also provide strength and conditioning training services for Club Iowa Volleyball (CIA). We provide progress reports for coaches and parents, as well as education for athletes so they understand their injuries. Stop in at our Saturday morning sports clinic in Waverly from 7:30 am to 10 am August 25th through October 20th. An individualized program is essential to identifying and correcting each athlete’s weaknesses and maximizing their athletic potential. Athletes in our program will be educated on technique and fundamentals to execute agility and sports specific tasks properly and efficiently, thereby enhancing performance and minimizing the risk of injury. Our goal is to not only develop a better sport specific player but develop a better athlete who can excel on multiple playing surfaces.